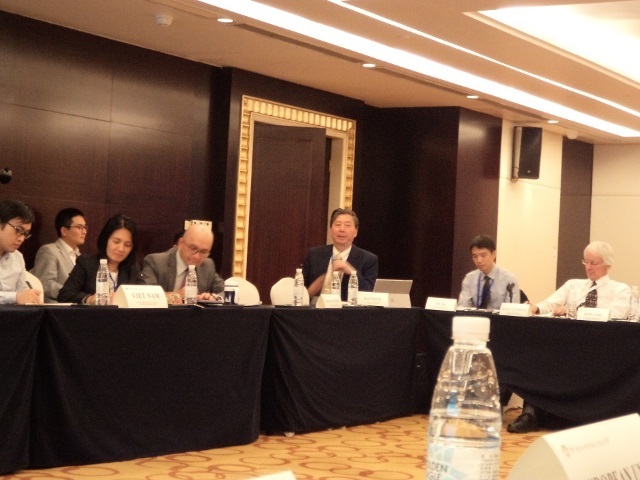 The following is a summary text of Mr. Ken Inoue`s presentation at the ASEAN Regional Forum workshop held in Nanjing, China, on 29-30 November 2018. – “Whereas it is essential, if man is not to be compelled to have recourse, as a last resort, to rebellion against tyranny and oppression, that human rights should be protected by the rule of law”. He then mentioned that the concept of human rights is based on dignity of an individual and rooted in the Western philosophy. The concept also has sensitive relationship with some religions. Therefore, while the concept of Human Rights is widely accepted as unversal values, some non-western countries and their leaders are hesitant to promote human rights. Mr. Inoue, therefore, proposed a new idea of Principles of Coexistence, based on Article 1-2 of the UN Charter, namely, “To develop friendly relations among nations based on respect for the principle of equal rights and self-determination of peoples, and to take other appropriate measures to strengthen universal peace”. This idea is different from so-called Asian value but probably more acceptable for non-Western nations as well as Western nations. 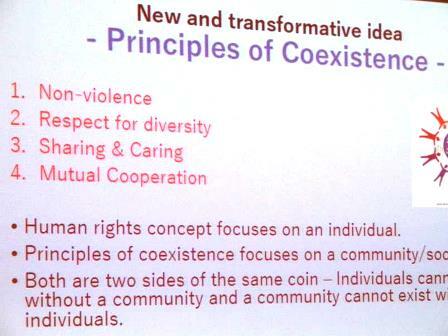 As indicated, Principle of Coexistence look at interest of a community as a whole and Human Rights look at interest of an individual member of the community. Therefore, both concepts are not competing each other, but mutually supplementing and reinforcing. In other words, Human Rights are essential to protect individuals in a community and the Principles of Coexistence are essential to protect harmony and integration of a community. Always, there is some tension between interest of a community and that of an individual member and narrowing a gap between two concepts in actual situation is a challenge for humanbeing. It may take a long time and civic education is essential to operationalize Principles of coexistence. However, Principles of Coexistence could be widely accepted by people and governments in non-western countries (Asia, Middle East and Africa). Therefore, it is worth promoting this concept to supplement Human Rights concept. ASEAN could consider taking leadership to adopt Universal Declaration of Principles of Coexistence at the UN General Assembly under the leadership of ASEAN.